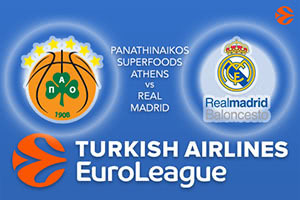 The away team are already guaranteed a place in the Euroleague playoffs and the hosts will fancy their chances of making it through but they need to get back to winning ways. Two defeats in a row has seen the Greeks wobble slightly and this game isn’t going to give them an easy or straightforward chance to get back to winning ways. Whether Madrid are as motivated as they could be remains to be seen but there is still a keen battle for the top of the table, so we will hopefully see a game that has plenty of excitement and drama. The fact that home-court advantage for the playoffs is still up for grabs should ensure that Real Madrid remain focused at this point of the season and given that Madrid’s strength lies in their attacking play, they have the second best offensive record in the league, there is a good chance that the Spaniards will play as normal. The strength of the Greek side lies in their defence, with the fourth best record in the Euroleague, so we have contrasting styles in this game. The teams have met on 15 occasions in the Euroleague so far, and it is Real Madrid who holds a slight edge, leading 8-7 on games played. The most recent outing of these two teams came back in Madrid earlier this season and the Spaniards clinched a tough game by a score of 87-84. Sergio Llull had a massive night, bagging 30 points which is a career high for the player. Llull has provided an average of 16.5 points per game so far this season while Anthony Randolph, with 10 points per game and Gustavo Ayon, with an average of 9.6 points per game have played their part in driving the team on. The hosts will look to Mike James, with an average of 12.7 points per game, to have an impact while Chris Singleton can boast of 11.9 points per game and KC Rivers has offered an average of 11.3 points per game. You can back Real Madrid at +1.5 at odds of 1.90. When it comes to the Over/Under market, look to go OVER 158.0 and you will find this bet available at odds of 1.90. Bet Now!